﻿Let’s face it, ever since Adam’s fall work has been no vacation. Do you spend most of your time at a job that seems to have no purpose or meaning? Do you work just so you can pay the bills? Do you feel tired, frustrated, overwhelmed, and unfulfilled in your work? Work is essential to life. Our work is the way we serve others and create blessings in the world. So why is it so hard? Going on Vocation is a two-part documentary and teaching series that explores these questions and more. Through personal stories of ordinary people at work and expert insight and advice from some of today’s leading voices on faith and work, you will discover that vocation or calling is about much more than your paid job. This series will challenge you to look at work in a whole new way and reap the positive returns of connecting your identity in Christ to your daily vocations. Going on Vocation not only has a winsome title, but also beautiful filming and moving content. 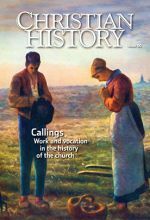 The viewer hears from scripture as well as theologians, poets, and novelists across the ages on the ways in which God calls His people to diverse vocations—in the home, community, workplace, nation, and the world. The film inspires us to view all of life redeemed, and to discern God’s voice in each of life’s seasons and many roles: as students, employees, employers, volunteers, parents, as well as in full-time ministry. This comes alive beautifully in the lives of everyday people who share their stories of following God’s call. From baker to business owner, college professor to police officer, we see how people learned to listen to the Caller’s voice and then pursue their vocations to God’s glory and in service to others. Their stories are our stories; in them we concur with the blessing work is in our lives despite the toil that sometimes accompanies it in a fallen world. We also get a glimpse of Heaven—how work will ultimately be redeemed as we answer the call home and then join in joyful service and creativity that was meant in that first call in Genesis, to fruitfulness and stewardship. The film is a delight. I plan to share it with students in my Career Counseling courses to aid them in reflecting on their own callings, as they prepare to assist others in finding meaningful work. Highly recommended. Not everyone has a dream job. Millions of people feel unfulfilled and unhappy in their work. Could they be looking at work all wrong? A new documentary teaching series challenges Christians to look at work a whole new way. Going on Vocation aims to help Christians connect their faith identity to any vocation and find their calling. Faith should not be turned off when people go to work, says Dr. Greg Foster, program director at the Kern Family Foundation. Faith should permeate attitudes and actions in every aspect of life. "We can find joy in helping people in a God-honoring way," adds Dr. Chris Armstrong, theology professor at Wheaton (Ill.) College. Going On Vocation uses personal stories of ordinary people at work to show that vocation or calling is about much more than a paid job. Noted scholars are joined by a waitress, a policeman, a stay-at-home father, and many others to explore how God calls Christians to a life of vocation. It aims to help viewers see their work, not as drudgery or obligation, but as an opportunity to live out their faith and see daily work as a way to serve others and create blessings. 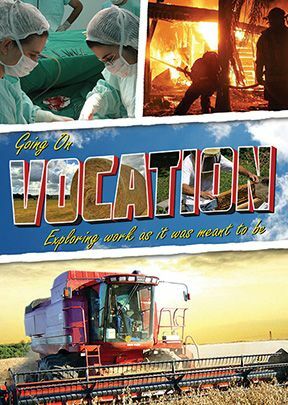 Going On Vocation: Exploring Work As It Was Meant To Be is a two-part documentary exploring the difficulties of working life, from a Christian perspective. Grounded in Scripture, Going On Vocation invites the viewer to rethink their career and vocation, including ways to incorporate Christ and his teachings to heart every day on the job. Insightful and revitalizing, Going On Vocation can be incorporated into four or eight study sessions; two PDF study guides are included on the DVD. In our work, the hands of Christ are extended to others. Our primary calling is to follow Christ. This can be in any number of secondary callings, not just the ordained ministry or church work. Released in April 2015, this DVD is a two-part documentary that explores the way work and faith can and should be interwoven in our lives. Through personal stories of ordinary people and expert insight from leading voices on faith and work, vocation is explained as more than a paid job. 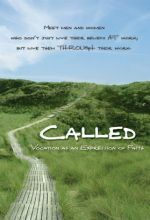 The first episode is "You Are Called" and focuses on the need to find your calling by God in the work that you do and the importance of the meaning of your work, no matter what it might be. One of my favorite quotes is: "Sometimes we discover almost by accident the calling God has for us in what we are doing." The second episode is "Be Transformed" and focuses on how ordinary people have found God in workplaces ranging from a farm to a chocolate shop to a diner. It asks the questions, "What kinds of things prevent your workplace in particular from looking like the kingdom of God?" and what can you do to be the hands of Christ in your work? There are excellent participants in the documentary, from David Miller, Director of the Princeton University Faith & Work Initiative to Ray Babcock, retired airline pilot and beekeeper, to Adrienne Tressler, server at the Chrome Grill in Connersville, Indiana. The documentary is primarily aimed at adult workers, but college age or mature high school age students would benefit from viewing the film, especially as they begin to enter the workforce. I would recommend using the accompanying study guide, prepared by Christian History Institute, whether watching as a group or as an individual study. Each episode's segment includes an opening exercise, scripture foundation, wisdom from the ages, discussion questions, closing exercise, and a prayer. What's the difference between a job and a vocation? That question is explored through a Christian perspective in this documentary illustrating how a personal vision—and sense of higher purpose—can be the most important part of work, no matter what a person does. The subjects who share their stories hail from a wide range of occupations, including a waitress, a nurse, a construction worker, a college professor, and a stay-at-home dad (currently jobless), who embraces the opportunity to spend both quality and quantity time with his kids (the experience has also helped him to grow in spiritual terms). The program, which also presents commentary from Christian scholars, acknowledges that finding a true calling within one's job is not always easy; for every individual who does so (such as the professional pilot-turned-beekeeper profiled here, who traded one set of wings for thousands of others), many more feel that their line of work is not particularly satisfying. For a number of interviewees, however, their sense of purposefulnes emerged over time, as both their religious beliefs and skills developed, and they became aware of previously unrecognized opportunities all around them. Embracing the concept of "bloom where you're planted," these individuals exemplify the aim of serving and living their faith every day, in every way. Offering a solid exploration of the intersection of faith and work, this is recommended. This is exactly the resource I have been looking for. Beautifully filmed and written, it touches people right where they are. In a fallen world, our work consists of both labor and toil, and this video paints a way of seeing it that is both true to our experience and gives a fresh gospel reframe to our understanding. As my wife and I watched the video together we kept turning to each other with a look that said “this is our life…and this is our hope.” By the end of Part 1 we were already feeling refreshed and encouraged. I can’t wait to share this outstanding resource with our congregation. I had already begun teaching a course on the Theology of Work when I received a copy of <i>Going on Vocation,</i> so I hadn’t worked it into my curriculum. After watching a couple of episodes I found a spot to use them, and the class loves them. I love the way it uses real down to earth people as illustrations of the topics and hits us right where we live. I also appreciate the length of each session. Thank you for producing these. I will continue to use them whenever I’m teaching on this topic.